The headquarters of the United Nations is a complex in New York City designed by Brazilian architect Oscar Niemeyer. The complex has served as the official headquarters of the United Nations since its completion in 1952. It is located in the Turtle Bay neighborhood of Manhattan, on spacious grounds overlooking the East River. Its borders are First Avenue on the west, East 42nd Street to the south, East 48th Street on the north and the East River to the east. The term "Turtle Bay" is occasionally used as a metonym for the UN headquarters or for the United Nations as a whole. The United Nations has three additional, subsidiary, regional headquarters, or headquarters districts. These were opened in Geneva (Switzerland) in 1946, Vienna (Austria) in 1980, and Nairobi (Kenya) in 1996. These adjunct offices help represent UN interests, facilitate diplomatic activities, and enjoy certain extraterritorial privileges, but only the main headquarters in New York City contains the seats of the principal organs of the UN, including the General Assembly and Security Council. All fifteen of the United Nations' specialized agencies are located outside New York City at these other headquarters or in other cities. The United Nations Headquarters complex was constructed in stages with the core complex completed between 1948 and 1952. The Headquarters occupies a site beside the East River, on between 17 and 18 acres (7 and 7 ha)[note 1] of land purchased from the real estate developer, William Zeckendorf, Sr. Nelson Rockefeller arranged this purchase, after an initial offer to locate it on the Rockefeller family estate of Kykuit was rejected as being too isolated from Manhattan. The US$8.5 million (adjusted by inflation US$83.9 million) purchase was then funded by his father, John D. Rockefeller, Jr., who donated it to the city. The Rockefeller family owned the Tudor City Apartments across First Avenue from the slaughter houses. 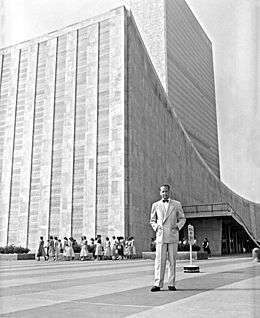 Wallace Harrison, the personal architectural adviser for the Rockefeller family and brother-in-law to a Rockefeller daughter, served as the Director of Planning for the United Nations Headquarters. His firm, Harrison and Abramovitz, oversaw the execution of the design. Many cities vied for the honor of hosting the UN Headquarters site, prior to the selection of New York City. The selection of the East River site came after over a year of protracted study and consideration of many sites in the United States. A powerful faction among the delegates advocated returning to the former League of Nations complex in Geneva, Switzerland. Suggestions came from far and wide including such fanciful suggestions as a ship on the high seas to housing the entire complex in a single tall building. Amateur architects submitted designs, local governments offered park areas, but the determined group of New York City boosters that included such luminaries as Grover Whalen, Thomas J. Watson, and Nelson Rockefeller, coordinated efforts with the powerful Coordinator of Construction, Robert Moses, and Mayor William O'Dwyer, to assemble acceptable interim facilities. 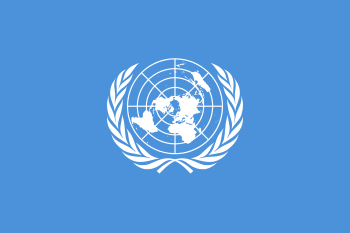 Their determined courtship of the UN Interim Site committee resulted in the early meetings taking place at multiple locations throughout the New York area. Sites in San Francisco (including the Presidio), Marin County, California, Philadelphia, Boston, Chicago, Fairfield County, CT, Westchester County, NY, and Flushing Meadows-Corona Park in Queens, were among those sites given serious consideration before Manhattan was finally selected. The Manhattan site was selected after John D. Rockefeller, Jr., offered to donate $8.5 million to purchase the land. In 1945–46 London hosted the first meeting of the General Assembly in Methodist Central Hall, and the Security Council in Church House. The third and sixth General Assembly sessions, in 1948 and 1951, met in the Palais de Chaillot in Paris. Prior to the construction of the current complex, the UN was headquartered at a temporary location at the Sperry Corporation's offices in Lake Success, New York, an eastern suburb of the city in Nassau County on Long Island, from 1946 to 1952. The Security Council also held sessions on what was then the Bronx campus of Hunter College (now the site of Lehman College) from March to August 1946. The UN also met at what is now the New York City Pavilion at the 1964 New York World's Fair site. The General Assembly met at what is now the ice skating rink, and the Long Island Rail Road reopened the former World's Fair station as United Nations station. The UN identifies Arabic, Chinese, English, French, Russian and Spanish as its six official languages. Delegates speaking in any of these languages will have their words simultaneously translated into all of the others, and attendees are provided with headphones through which they can hear the translations. A delegate is allowed to make a statement in a non-official language, but must provide either an interpreter or a written copy of his/her remarks translated into an official language. English and French are the working languages of the United Nations Secretariat, as most of the daily communication within the Secretariat and most of the signs in the UN headquarters building are in those languages. The General Assembly building, housing the United Nations General Assembly, holds the General Assembly Hall which has a seating capacity of 1,800. At 165 ft (50 m) long by 115 ft (35 m) wide, it is the largest room in the complex. The Hall has two murals by the French artist Fernand Léger. At the front of the chamber, is the rostrum containing the green marble desk for the President of the General Assembly, Secretary-General and Under-Secretary-General for General Assembly Affairs and Conference Services and matching lectern for speakers. Behind the rostrum is the UN emblem on a gold background. Flanking the rostrum is a paneled semi-circular wall that tapers as it nears the ceiling and surrounds the front portion of the chamber. In front of the paneled walls are seating areas for guests and within the wall are windows which allow translators to watch the proceedings as they work. The ceiling of the hall is 75 ft (23 m) high and surmounted by a shallow dome ringed by recessed light fixtures. The entrance to the hall bears an inscription from the Gulistan by Iranian poet Saadi. The General Assembly Hall was last altered in 1980 when capacity was increased to accommodate the increased membership. Each of the 192 delegations has six seats in the hall with three at a desk and three alternate seats behind them. Besides the actual and outer structures that make up and surround the United Nations Headquarters are the inner groups that play a role as well. The Security Council containing 5 permanent and 10 temporary for a total of 15 members, ensures the stabilization of peace and security whether in terms of threats or simple adjustments. A heavier focus on actual activities like debating in policymaking, and reflecting in and out of the environment, is conducted by the Economic and Social Council. On July 28, 2007, UN officials announced the complex would undergo a $1 billion renovation starting in the fall. Swedish firm Skanska AB won a bid to overhaul the buildings which including the Conference, General Assembly and Secretariat buildings. The renovations, which will be the first since the complex opened in 1950, are expected to take about 7 years to complete. When completed the complex is also expected to be more energy efficient and have improved security. Work began on May 5, 2008 but the project was delayed for a while. By 2009 the cost of the work had risen from $1.2 billion to $1.6 billion with some estimates saying it would take up to $3 billion. Officials hope the renovated buildings will achieve a LEED Silver rating. Despite some delays and rises in construction costs, renovation on the entire UN headquarters is progressing rapidly. As of 2012, the installation of the new glass facade of the Secretariat Building is completed. The new glass wall will retain the look of the original facade but it will be more energy efficient. The renovation of the Secretariat building has been complete and the UN staff moved into the new building in July 2012. The renovations are nearing completion in 2016, with the cost having risen to $2.15 billion. After the multi-year process, the UN Headquarters now includes new electronics, audio and language systems, heating and cooling installments, and is said to be more safe as well as more energy efficient compared to before. With these new additions, general public visitations have increased and guided tours are even available. Some governments have offered potential sites should the UN decide to move. In 2007, La Presse reported that the Canadian government, along with provincial and municipal authorities, proposed Montreal as a new site for the headquarters; a former docklands site was earmarked and preliminary drawings made, but the UN turned down the request in 2007 and opted to renovate its existing facilities instead. In 2010 the Dubai government offered Dubai as an ideal venue due to its proximity to international "trouble spots". 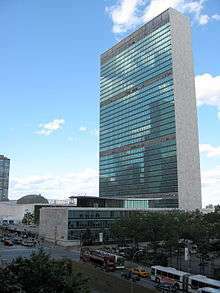 Due to its role in international politics, the United Nations Headquarters is often featured in movies and other pop culture. The only film actually shot on location in the UN headquarters is The Interpreter (2005), filmed with the consent of the Secretary-General, although some scenes in the political documentary film U.N. Me (2009) were surreptitiously filmed inside the building without permission. When he was unable to obtain permission to film in the UN Headquarters, director Alfred Hitchcock covertly filmed Cary Grant arriving for the 1959 feature North by Northwest. After the action within the building, another scene shows Grant leaving across the plaza looking down from the building's roof. This was created using a painting. In the 1976 comedy film The Pink Panther Strikes Again, the building is vaporised by Dreyfus with a doomsday device. The final Roadblock of the 21st season of the American version of The Amazing Race also took place inside the gates of this building and had teams associating national flags with the different "hellos" and "goodbyes" they heard during the race. The building is seen in the 2008 game Grand Theft Auto IV, but called the Civilization Committee Building (CC). The building is also in the racing game The Crew in the New York City area of the game. Charlene Mires (2013). Capital of the World: The Race to Host the United Nations. NYU Press. ISBN 978-0814707944. ↑ Sources vary on whether the site is 17 acres (7 ha) or 18 acres (7 ha). 1 2 3 4 Hamilton, Thomas J. (October 10, 1952). "Work Completed on U.N. Buildings". The New York Times. p. 1. Retrieved August 20, 2011. ↑ "United Nations Visitors Centre". United Nations. Retrieved October 24, 2011. ↑ "Turtle Bay blog". Foreign Policy. foreignpolicy.com. Retrieved October 24, 2011. ↑ Kelsen, Hans (1950). The law of the United Nations: a critical analysis of its fundamental problems. The Lawbook Exchange, Ltd. p. 350. ISBN 1-58477-077-5. ↑ Boland, Ed Jr. (June 8, 2003). "F.Y.I.". The New York Times. Retrieved July 9, 2010. ↑ Phipps, Linda S. "'Constructing' the United Nations Headquarters: Modern Architecture as Public Diplomacy" PhD Thesis, Harvard University, 1998. Phipps' account affords a detailed overview of the site acquisition, the selection of architects, the design of the complex and its reception. 1 2 3 4 "Fact Sheet: United Nations Headquarters". United Nations. Retrieved January 6, 2011. ↑ "Oscar Niemeyer and the United Nations Headquarters (1947–1949)". United Nations. December 2014. Retrieved November 4, 2014. ↑ Dudley, George A., A Workshop for Peace: Designing the United Nations Headquarters, (Cambridge, MA and London, England: MIT Press and the Architectural History Foundation, 1994) p. 314. Dudley provides an accurate and detailed account of the Design meetings as well as discussing the evolution of the final design. ↑ Phipps, Linda S., "'Constructing' the United Nations Headquarters: Modern Architecture as Public Diplomacy," Ph.D. thesis, Harvard University, 1998; Chapters 1 and 2. ↑ "Lake Success: A Reluctant Host to the United Nations". Newsday. New York. Archived from the original on May 23, 2006. Retrieved March 22, 2009. ↑ "About Lehman College". Lehman College. Archived from History of Lehman College the original Check |url= value (help) on October 9, 2007. Retrieved March 22, 2009. ↑ "The Story of United Nations Headquarters" (PDF). United Nations. Retrieved September 8, 2009. ↑ "The History of Ice Skating in New York City Parks". New York City Department of Parks and Recreation. Retrieved November 26, 2010. ↑ "United Nations Station". Arrt's Arrchives. August 14, 2004. Retrieved October 24, 2011. ↑ Childers, Erskine (September 29, 1995). "Financing the UN". Global Policy Forum. Retrieved October 24, 2011. ↑ "The Story of United Nations Headquarters". United Nations. July 2006. Archived from the original on August 15, 2010. Retrieved November 26, 2010. ↑ "UN/Volcker Report". United Nations. August 8, 2005. Archived from the original on November 5, 2011. Retrieved November 26, 2010. ↑ "Q&A: Oil-for-food scandal". BBC News. September 7, 2005. Retrieved November 27, 2013. ↑ "Security Notice – United Nations Headquarters". United Nations. 2001. Archived from the original on July 25, 2009. Retrieved November 26, 2010. ↑ For example, Richard Roth is CNN's UN correspondent, while Ian Williams is his counterpart at The Nation and Carola Hoyos is the UN correspondent for the Financial Times. ↑ "The General Assembly". United Nations. Archived from the original on March 19, 2011. Retrieved November 26, 2010. ↑ Axworthy, Michael (2010). Iran: Empire of the Mind. Basic Books. p. 110. ↑ "The Security Council". United Nations. Retrieved November 26, 2010. ↑ Hamilton, Thomas J. (October 10, 1953). "Work Completed on U.N. Buildings". The New York Times. p. 1. Retrieved August 7, 2011. ↑ "Office of Legal Affairs". United Nations. Retrieved November 26, 2010. ↑ "United Nations Disarmament". United Nations. Retrieved November 26, 2010. ↑ "DGACM". United Nations. Retrieved November 26, 2010. ↑ "Hammarskjold Library Dedicated". The New York Times. November 17, 1961. p. 5. Retrieved July 9, 2010. ↑ "Collections". United Nations. Retrieved November 26, 2010. ↑ "Luxembourg Mission to the UN". United Nations. Retrieved November 26, 2010. ↑ "Swords into Plowshares". United Nations. Retrieved November 26, 2010. ↑ Jewett, Robert; Lawrence, John Shelton (January 2003). Captain America and the Crusade Against Evil: The Dilemma Of Zealous Nationalism. William B. Erdmans Publishing Co. p. book jacket. ISBN 978-0-8028-6083-5. Retrieved October 24, 2011. ↑ "Piece of Berlin Wall, a gift of Germany, unveiled at UN garden". United Nations. April 4, 2002. Retrieved November 26, 2010. ↑ "Chagall Stained Glass". United Nations. Retrieved November 26, 2010. ↑ "Japanese Peace Bell". United Nations. Retrieved November 26, 2010. ↑ "Chinese Ivory Carving". United Nations. Retrieved November 26, 2010. ↑ "Norman Rockwell Mosaic". United Nations. Retrieved November 26, 2010. ↑ Cohen, David (February 6, 2003). "Hidden Treasures: What's so controversial about Picasso's Guernica?". Slate.com. Retrieved October 25, 2011. ↑ Marks, Ed (Winter 1998). "Art...at home in the United Nations". UN Chronicle. Findarticles.com. Retrieved October 25, 2011. ↑ "An 'element of inspiration and calm' at UN Headquarters – art in the life of the United Nations". UN Chronicle. FindArticles.com. December 1990. Retrieved October 25, 2011. ↑ "Investigations Hotline". United Nations. Retrieved November 26, 2010. ↑ Hodge, Warren (November 28, 2007). "After 10 Years and 3 Plans, U.N. Renovation Is in Sight". The New York Times. Retrieved October 25, 2011. ↑ Farley, Maggie (May 6, 2008). 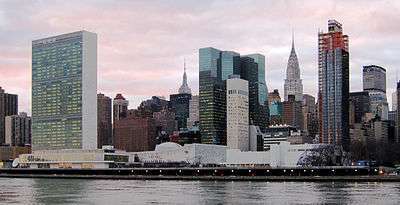 "'A time of rebirth' at U.N. site". Los Angeles Times. Retrieved October 25, 2011. ↑ "U.N. Renovation Cost Jumps $400M". CBS News. Associated Press. February 11, 2009. Retrieved October 25, 2011. ↑ "United Nations Capital Master Plan: Current Status". Retrieved August 2, 2012. ↑ "United Nations Capital Master Plan: Timeline". Retrieved August 2, 2012. ↑ "U.N. may move to Brooklyn temporarily". USA Today. Associated Press. May 10, 2005. Retrieved July 9, 2010. 1 2 New York Daily News, Fred A. Bernstein: "United Nations Should Move to World Trade Center Site." November 6, 2001, column archived at Bernstein's website. ↑ Kjelstad, Carina (May 16, 2006). "Without Action Now, the UN Capital Master Plan Is Not Going Anywhere Anytime Soon". Global Policy Forum. Retrieved October 24, 2011. ↑ "MAYOR BLOOMBERG ANNOUNCES HISTORIC AGREEMENT TO CLOSE LAST MAJOR GAP IN THE MANHATTAN GREENWAY AND ENABLE MODERNIZATION OF THE UNITED NATIONS' NEW YORK CITY PRESENCE". Press Release. City of New York. October 5, 2011. Retrieved September 7, 2012. ↑ Foderaro, Lisa (September 30, 2011). "Land Deal With U.N. Would Fill a Big Gap in the Waterfront Greenway". news article. The New York Times. Retrieved September 7, 2012. ↑ Haberman, Clyde (February 25, 2005). "Act Globally, Get Stuck Locally". The New York Times. Global Policy Forum. Retrieved October 24, 2011. ↑ "UN Makeover Sacrifices Hammarskjold Library for Security". New York Times. 3 September 2015. Retrieved 25 October 2016. ↑ admin (2013-12-11). "Hours". visit.un.org. Retrieved 2016-11-17. ↑ "Merits of Moving the UN HQ to Baghdad". Laetus in Praesens. April 12, 2003. Retrieved October 24, 2011. ↑ "Iran pursues relocation of UN HQs". WilayahNews.com. ↑ "Russia may call for moving U.N. from New York to St Petersburg". Johnson's Russia List. May 14, 2001. Retrieved October 24, 2011. ↑ DeWolf, Christopher (October 25, 2007). "Will the UN move to Montreal – and how will it affect the waterfront?". Spacing Montreal. Retrieved November 26, 2010. ↑ Salama, Vivian; AlKhalisi, Zahraa (January 14, 2010). "UN Is Invited to Relocate to Dubai, Government Says". Bloomberg News. Retrieved October 24, 2011. ↑ "NSA bugged UN headquarters in New York City, claim new documents released by Ed Snowden". Daily Mail. London. ↑ "Morales says UN headquarters must move from 'bully' US". Inside Costa Rica. September 26, 2013. Retrieved April 30, 2014. ↑ Saulny, Susan (February 11, 2003). "Court Bans Peace March in Manhattan". New York Times. Archived from the original on June 17, 2010. Retrieved November 26, 2011. ↑ "Seton Hall Summer Study Program UNA-USA". UNAUSA. Retrieved November 26, 2010. ↑ "United Nations Photo". Unmultimedia.org. September 10, 2003. Retrieved April 30, 2014. ↑ "The Interpreter (2005) – Trivia". imdb. Retrieved October 24, 2011. ↑ Thill, Scott (December 6, 2009). "8 Reasons Hitchcock's North by Northwest Still Rules". Wired. Retrieved October 25, 2011.